Everything you need to know to sew kites from ripstop nylon. It's not Kite Making 101, because kites can be made without sewing. It's not Sewing 101, because there are many techniques we will talk about that are unique to sewing kites.This page is an expanded version of what was presented at the American Kitefliers Association National Convention in Ocean City, MD on Wednesday, Oct 2, 2002. As time allows, I'll get back in here and make it a little easier to navigate by either adding frames or anchors. For now, my aim was to get it up first, make it better later. If you are new to sewing, don't buy a new machine. In fact, don't buy a machine at all. Find one for free. Pick one out of the trash. Tell everyone you know that you want to learn to sew kites and someone will feel so sorry for you that they will give you a machine. Metal body and gears, stronger motor and belts. Simple, all gear and cam driven. No step motors. You don't need 1,000 different stitches. You will only ever use four. Okay, so 'four' is a number I picked out of thin air. Lemme see, (1) Straight, (2) Zig-Zag, (3) 3-Step Zig-Zag, (4) Reverse. Do you absolutely have to have a new machine? If you answered yes, here is a list of what to look for. This is a wish list, a set of guidelines. Perfectly good kites can be made without any of the following items. In the Seminar at Convention it was mentioned that National Grand Champion kites have been made on machines that straight stitch only. Vertical bobbin, not a flat drop-in. Ability to stop Needle up / Needle down. Some electronic machines have a button to push which makes the needle always stop in the 'down' position, into the fabric. This is very handy when sewing appliqué .Pushing the button again makes the needle always stop in the 'up' position. This makes it easy to remove work and trim threads without having to move the handwheel to bring the needle to proper position first. Very wide zig-zag. Most will do 5 mm. Look for 5.5 to 6 mm. A 3-step or Triple zig-zag. RTFM. Read the Manual. Don't have a Manual? - get one! Most stores will copy one for you. Threading the machine properly from the spool of thread to the needle is critical. Learn the proper thread path for your machine. How to wind & thread & insert the bobbin. How to set bobbin tension. How to set top tension. How to adjust stitch length and width. How to use reverse, if it has it, to back tack (bar tack). Where, when and how to oil. Older machines have more places, use grease-like lubricant in some spots. Newest machines generally only need a drop of oil on the Bobbin Race. Flat bobbin and slant needle machines: All slant needle machines have flat drop-in bobbins. 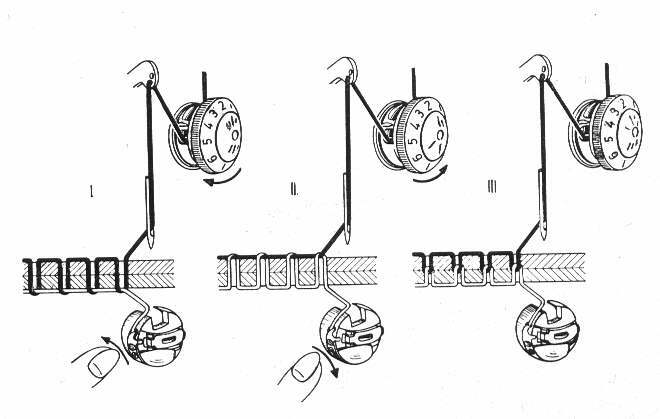 The following bobbin tension technique won't work for flat bobbins machines because the bobbin case and race cannot be conveniently removed. It can still be done, but it is more tedious. The Bobbin still needs to be adjusted first, but it needs to be done with the case in the machine. Sewing kites involves working with thin and slippery material. 'Normal' thread tensions will tend to pucker up the fabric. Kite sewing usually involves much lower tension, both top and bottom. Note: At the sewing store, when you buy a machine, they will say: "See that? That's the bobbin. Don't touch it!" If you plan to sew ripstop, you will not only need to touch it, you will need to become very comfortable with adjusting it on a regular basis for every different thread you intend to use. Remove Bobbin Case from machine. Check Manual for how to do this on your machine. Holding latch open holds Bobbin in Case. When the Latch is closed, Bobbin will fall easily out of Bobbin Case. Hold Bobbin and Case by thread. Bobbin and Bobbin Case should just fall under its own weight. This is just a place to start from, a guideline. Left loose, right tight. Turning the screw counterclockwise will lower the bottom tension. The screw should turn easily without a screwdriver. Replace Bobbin & Case into the machine. Holding latch open holds Bobbin in Case. Make sure Bobbin Case is fully inserted in Bobbin Race. With Bobbin in machine, sew a row of stitches on a piece of scrap. Set/check tension on same type material you intend to sew. If bottom stitches are being pulled UP, lower top tension. If top stitches are being pulled down, increase top tension. If stitches are even, no bumps top or bottom, no puckers in cloth, good to go. If fabric is puckering, remove Bobbin, lower bottom tension, and start over. Very big loops of very loose thread on bottom means no top tension. Check the thread path again. Make sure the thread is between the disks and under the spring on older machines. Make sure the thread is to the left of the pressure plate on newer machines. In the illustration above, (I) the bottom tension is tighter than the top. (II) shows top tension tighter than bottom, (III) shows ideal tension with both threads meeting in the middle. Using two different colored threads of equal thickness makes it easier to see the differences for adjustment. Needle: It is tempting to think of the needle as simply poking the thread through the fabric to sew. That is only a small part of the picture. 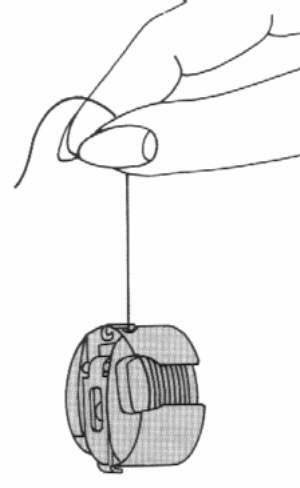 Think of the needle as a delivery system to get the top thread to the bobbin race so the rest of the sewing machine can complete the stitch. The thickness of the thread, the groove in the side of the needle, the scarf on the back of the needle, the size of the eye of the needle, and the size of the hole the needle makes on the fabric all contribute to how well the actual stitch comes out. Needle and thread note: How many times would you guess that one section of top thread passes thru the eye of the needle? Once? Twice maybe? Would you believe that using HB-33 thread at 8 stitches to the inch (3 mm), one section of thread passes back and forth thru the eye of the needle 24 times? Actually, that is 24 round trips, which means 48 passes through the eye. Think of that when choosing needles and thread. Small needles with small eyes trying to sew lumpy thread often have tension problems. Too small a needle invites tension problems. Best to use is a #14, 90 European, Regular Point. We can make a good case for using 16's and 18's too. Make note of where the 'flat' is before you take it out. Put it back in the same way it came out. Make sure it is all the way in. If you didn't look at the way it came out, there is a one-in-four chance of putting it in right. 'Flat' goes away from last thread guide. Use the brand that came with the machine, the brand the Manual recommends. There is a relief, a scarf, a 'gouge' on one side of the needle that makes it possible for the bobbin race hook to grab the thread. The shape of this scarf is different on different brands of needles. Different brands of machines require different brands of needles. Don't sew with a bent or dull needle. Dull needles make a 'snap' noise in the fabric. Bent needles will drop stitches, especially in zig-zag. Thread: One of the most critical components of sewing and most often overlooked. Friends don't let friends sew with anything from Coats & Clark. Using a Thread Stand (properly) is strongly recommended. Available at JoAnn Fabrics, The Fabric Place, Hancock, Wal-Mart and other notions stores. Overlock and serger cone thread is cheap and breaks very easily. It is okay for satin stitching appliqué on flag cloth (not ripstop) but nothing else. Mettlers Metrosene, Güterman, or Mölnlycke polyester threads are acceptable substitutes but are made from many short yarns and fuzz up the inside of the machine. Color matching: Not always a good road to start down. Mettlers Metrosene, Güterman, Mölnlycke, polyester threads often different colors have different diameters, different tension settings. Must re-tension every time colors change. Make sure thread is 'color fast'. Some 'bleed' when wet. An easy way to 'color match' thread to fabric is to color it later with Sharpies (permanent magic markers). BEST threads are HB (or HSB) 33 nylon or V 30 polyester. These are commercial grade threads. They have very consistent diameters and run very clean. They are very strong for their diameter. Polyester is a little softer than nylon. Polyester has better UV resistance than Nylon. Nylon is a little stiffer than polyester. These threads are available from kite making supply houses like those listed at the end of this page. Fabric: First, some quick notes about Spinnaker Cloth, or 3/4 ounce ripstop nylon/polyester. Because of its coating, it is very crisp, almost stiff. It holds a crease very well without ironing. Simply creasing a hem will give the fabric enough memory for it to stay in place for sewing. Ripstop: to keep it light, is woven from many small threads. Every 1/8 inch or so (usually) a thicker stronger thread is woven in. Any 'rip' will 'stop' at the thicker thread. ¾ ounce means one square yard weighs ¾ ounce. Kite fabric is very stable, may be COLD CUT or HOT CUT. Uncoated untreated fabric is called griege (gray) goods. Only a few mills weave, many places dye & coat, some places only convert. Because of the coating, ripping out leaves a line of needle holes. Fabric is woven. Long straight threads are WARP. Short crooked ones are WEFT. When strength is needed, cut along WARP threads. degrades in ultraviolet light. Its dyes degrade too. Fluorescents degrade the fastest, white is almost as bad. The darker the color, the greater the resistance to UV. Lasts much longer in UV. Bright colors fade less. Colors tend to 'offset', or bleed when in storage. Hand wheel always turns TOP towards you. Never away. Don't sew with nothing in the machine. Don't sew air. It's begging for a tangle, and it wears out Feed Dogs & Presser Foot. Only lift Presser Foot when needle is all the way up or down, never mid-stroke. Sewing slow and steady and accurately is better than fast and messy. Shift fabric with needle down. Especially for appliqué. Always cut thread with scissors, close to the work, leave at least 4 inches. Doesn't wear out cutter on machine, don't have to trim a second time. Always cut the little thread tails off the bobbins right after they are wound. These are lockstitch machines. Backstitch only a stitch or two. Industry Standard is 8 stitches to the inch. Let the machine do the work. Don't pull or push. Trim threads as you go. Zig-zag is weaker than straight stitch, but covers a multitude of sins. STORE machine covered, Presser Foot down, with fabric under Foot. Presser Foot is straight and installed properly. Straight means left to right and also level, or parallel to Feed Dogs. Presser Foot meets Feed Dogs evenly. On older machines, Dogs could be worn. Seek professional help. 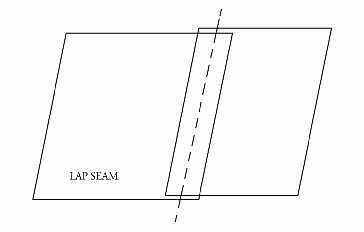 Seams: Seams join two or more layers of fabric. There are many different kinds of seams. Most often used are Plain and Lap,also Flat Fell or Double French, and Mock French. Terms differ among different schools of sewing. It doesn't really matter if you call the different seams Tom, Harry and Fred, as long as you know what they are and when to use them. Lap seam is simply put one layer over the other and sew. This is what our appliqué seams end up being. The Plain Seam is the most commonly used seam in kite making. (Some people call this Flat Fell, but the Flat Fell is also called the French Seam.) Match up the edges, and sew. Open out the bottom panel, fold over the sewn part, and sew down again. It is a strong seam that doesn't 'bulk up' with a lot of layers. It is only 3 layers deep. The Mock French Seam starts out just like the Plain Seam. After the bottom panel is opened out, the sewn flap is folded in half, with the raw edge going between the flap and the bottom panel. Then the folded flap is sewn down. This gives a very finished look, but is not a good idea where may seams will overlap, since it is 5 layers of fabric thick. The French (or Flat Fell) Seam is the seam you see running down the outside of your jeans. It is a very strong seam and is frequently used in tents and jeans and hot air balloons. It is also called Full French or Double French to distinguish it from the Mock French. It is more complicated to sew because the bottom layer needs to have 2 seam allowances added instead of one. It takes a lot of planning to use one of these seams. 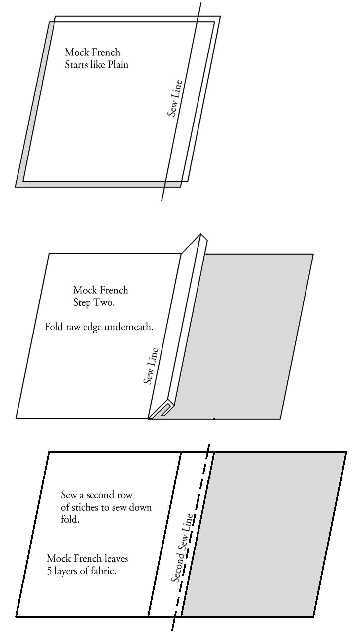 The Franch Seam is better than the Mock French in that it is only 4 layers of fabric thick instead of 5. I have used it once or twice when making sides for EZ-Ups, just to prove I could. Choose a seam allowance that works for you. Most plans denote 'finshed' sizes, you will need to add your favorite seam and hem allowances and plan accordingly. 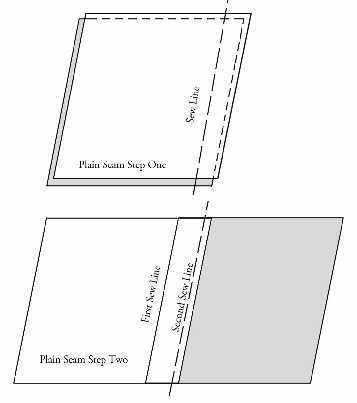 Draw template for panel, add seam and hem allowances. On angled panels, sew line needs to match edge line. Can hot cut panels together. Seamstick or tape can work. Duct tape sometimes. Use seamstick in areas where it won't show or where it can be removed later. Dark colors will show thru lighter colors if seamstick is in between. Straight pins are last resort.They bunch the fabric and put holes in the coating. Can use edge of Presser Foot as guide. Use marks on Throat Plate as a guide. 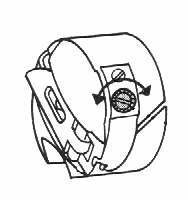 Can use tape placed on machine as guide. You will develop your own taste for seam allowances. You will develop your own tastes for size of hem. Double fold hems last longer than single fold hems. For accuracy, mark a line on GOOD side, crease on line. For double fold hem, fold again to the fold. Bias tape is a good way to finish a curved edge. To hem a curved edge, mark, fold, use a Hemming Foot. Appliqué - applying bits of cloth to add graphics to a surface. Back tack / back stitch / lock stitch - backing up two or three stitches to lock the beginning or end of a row of sewing. Basting stitch - very long stitch used to hold something in place temporarily because it is easily ripped out later. Not a good idea when making kites. Bias tape/Edge Binding - Tape for finishing a fabric edge, especially when the edge is curved. Tape may be made from scraps or purchased at a sewing store/supply house. BIAS TAPE is cut on the bias and stretches to follow a curve very easily. GROSGRAIN TAPE is cut on the grain and doesn't follow a curve as well. Bobbin - very small spool that holds thread inside the sewing machine and provides the bottom thread on a lockstitch sewing machine. Bobbin Case - case which holds the bobbin and controls the tension of the bobbin thread as it enters the machine. Bobbin Race - Part of the sewing machine which holds the Bobbin and Bobbin Case and contains the Bobbin Hook which picks up the Top Thread out of the Needle and pulls it around the bobbin. Denier - Term that denotes the thickness of the thread. It stands for the weight in grams of 9,000 meters of the thread. Basically the bigger the number, the thicker the thread. Common kite sewing deniers are 30 and 33. Dual feed: An integrated feed foot that is driven to move with the feed dogs to move fabric more easily. See also Walking Foot. Edge Binding/Bias tape: Tape for finishing a fabric edge, especially when the edge is curved. Tape may be made from scraps or purchased at a sewing store/supply house. BIAS TAPE is cut on the bias and forms a curve very easily. GROSGRAIN TAPE is cut on the grain and doesn't follow a curve as well. Feed dogs/feed feet - the jagged teeth under the needle that move the fabric thru the machine. Grain - the threads of the fabric. Cutting along the threads in either direction is cutting on the grain. Cutting in any direction not along the threads is cutting on the bias. Greige Goods - (pronounced 'gray goods') fabric straight from the weaving loom with no finishing treatments. 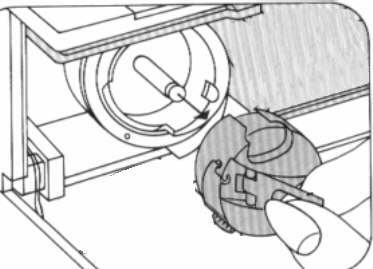 Hand wheel: wheel on right side of sewing machine for advancing needle or stitches manually. Notions - all the other stuff needed to sew. Needles, thread, scissors, etc. Presser Foot - Feed foot that presses the fabric against the Feed Dogs. Many machines have a means of adjusting the pressure with which the foot presses on the fabric. Ripper/Seam Ripper - Hand held tool for ripping out stitches. Ripstop - Fabric woven with thin threads with thicker threads added at regular intervals. Any 'rip' will 'stop' at the thicker thread. Satin Stitching: Many stitches close together to 'bind' layers of fabric to prevent fraying. Useful for flagcloth appliqué. Seamstick - double sided sticky tape used to hold layers of fabric together for sewing. Tension - the part of the machine the controls the amount of 'pull' there is when the stitch is pulled tight. Also, the amount of pull there is when the stitch is pulled tight. Balance tension - making sure that the top and bottom tensions pull the same amount so the knot or loop where they meet is right between the layers of fabric being sewn. Thread Path - Path of thread through the sewing machine from the spool to the needle. Timing - The top of the machine runs everything on top including the needle up and down and zig-zag. The bottom of the machine runs everything on the bottom including the Bobbin Race and the Feed Dogs. Since the needle and the bobbin hook need to be in the same place at the same time, the top and bottom need to be 'timed' to run together smoothly. Sometimes a machine can jump time and the bobbin hook won't pick up the thread no matter what. Time to call the professionals. Throat Plate - Also called the Aperture Plate. The plate under the needle and Presser Foot where the feed dogs protrude. Usually it is easily removable to clean underneath. Walking Foot - an after market (sold separately by manufacturers often other than that which made the sewing machine) Presser Foot that has rubber dogs on the bottom that move with the Feed Dogs. Often gives a more reliable feed in slippery fabric than factory Presser Feet. Warp - when fabric is woven on a loom, these are the long continuous thread that go the entire length of the roll of fabric. These are generally much straighter than the weft, or fill, threads. This means they will stretch less over time. Weft - in woven fabric, these are the threads carried back and forth by the shuttle and combed into place. They can very crooked and so tend to stretch more than the warp grain of the fabric. E-mail: steve@kitebuilder.com Hang-'em High, 1420 Yale Ave, Richmond, VA, 23224 Phone: 804-233-6155. 3420 Stone Way North, Seattle WA 98103.